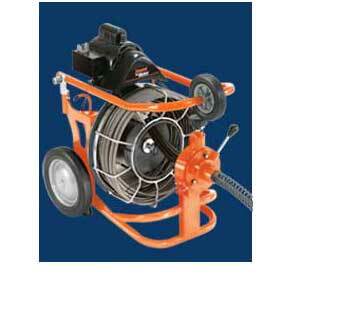 The variable speed power cable feed makes The Metro easier for your customers to use. The automatic feed drives cable into the line at up to 20 feet per minute. Put the feed in reverse and it retracts the cable easily too. 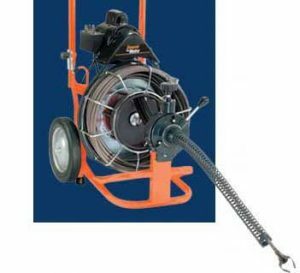 The Power cable feed and guide tube combination allows the cable to feed smoothly into the line while keeping your customers hands clean and away from the spinning cable. The Metro’s heavy-duty reinforced frame takes rough handling in the field. The big 10” heavy duty wheels and a truck loading wheel make it easier to transport the machine to and from the job. A cutter holder on the frame keeps all the cutters within easy reach. And the fold down handle makes the machine more compact to take up less space in the truck. Clears in 2” to 4” lines. Variable speed Power Cable Feed drives and retracts cable at up to 16 ft. per minute. Cage capacity of 100 ft. of 9/16″ Flexicore® cable. Open cage lets you see cable condition after each rental. Heavy-duty reinforced frame and drum support shaft takes rough handling in the field. Handle folds for space-saving convenience in the truck or in the garage. Ten-inch wheels and a truck loading wheel make for one-person handling. Passive brake system holds the machine in place on the job and in the truck. Momentary contact reverse switch and pneumatic foot pedal..
1/3 hp capacitor motor has plenty of power. The handle is tall enough to make it easy to move to the job, yet quickly folds to take less room in your truck. 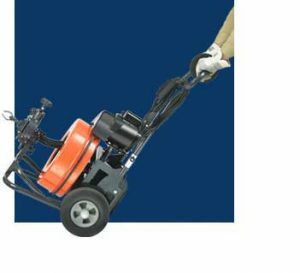 Ten-inch heavy-duty semi-pneumatic wheels roll easily over rough terrain to and from the job. Truck loading wheel in the handle makes it easy for one person to lift the machine onto a truck bed. 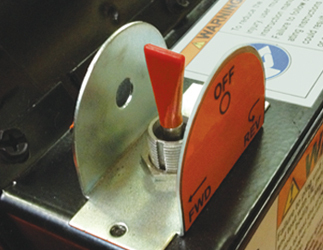 A momentary contact reverse switch protects the cable by preventing the operator from running the machine in reverse for more than a few seconds at a time. Reduces chance of cable tangling or injury to the operator. Allows V-belt to slip through pulley until torque is reduced. 27” deep x 18-1/2” wide x 46” high–26” (66cm) high with handle folded down (68cm x 47cm x 117cm). Remove two bolts and slide drum off shaft. 1/3 hp with capacitor start, forward-off-reverse switch, 20 ft. power cord and ground fault circuit interrupter. Drives and retracts cable at variable speed without having to reverse motor rotation. 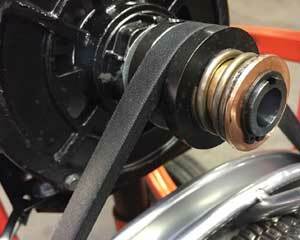 Passive wheel brake system holds the machine in place on the job and in the truck. Tall enough to make it easy to move to the job, yet quickly folds to take less room in vehicle. Enables one person to lift machine into truck bed. Cutter Holder on the frame keeps all the cutters within easy reach.